After the costumed bacchanalia of Halloween comes Dia de los Muertos (that's the Day of the Dead for those of you who took French in high school), a kind of welcome home party for those who've passed on. 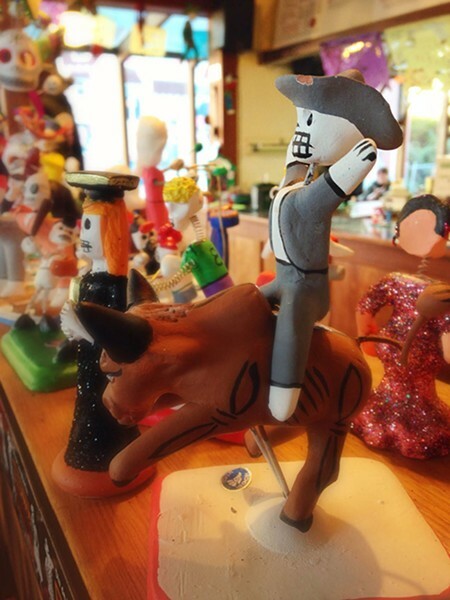 Get a little taste of the tradition at Los Bagels shops this week — check out the ofrendas (altars to the dear departed) and whimsical skeleton-filled art. In Eureka, don't miss Greta Turney's bony R2-D2. If you're dying for a snack, try some lightly sweet and spiced pan de muerto (dead bread) loaves. Calacas: cute and creepy Dia de los Muertos tchotchkes. If you're not already celebrating with friends and family, join the celebration at Sunrise Cemetery in Fortuna — which has been busy lately for a graveyard — on Saturday from 11 a.m. to 2 p.m. Kristy Carlsen of College of the Redwoods gives a history of the holiday at 11 a.m. and 1 p.m., and Real de Mexico plays mariachi tunes from 11:30 a.m. There's also a walking tour and a chance to do some traditional arts and crafts. If it gets chilly, warm your bones with some pan de muerto and a nutty Mexican hot chocolate.